What Day Of The Week Is October 11? 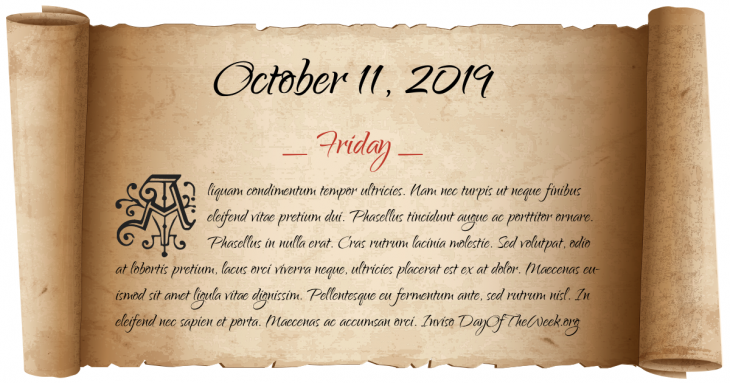 October 11, 2019 is the 284th day of the year 2019 in the Gregorian calendar. There are 81 days remaining until the end of the year. The day of the week is Friday. Because of the implementation of the Gregorian calendar, this day does not exist in this year in Italy, Poland, Portugal and Spain. The Burchardi flood – “the second Grote Mandrenke” killed around 15,000 men in North Friesland, Denmark and Germany. American Civil War: In the aftermath of the Battle of Antietam, Confederate General J.E.B. Stuart and his men loot Chambersburg, Pennsylvania, during a raid into the north. San Francisco public school board sparks United States diplomatic crisis with Japan by ordering Japanese students to be taught in racially segregated schools. Former President Theodore Roosevelt becomes the first U.S. president to fly in an airplane. He flew for four minutes with Arch Hoxsey in a plane built by the Wright Brothers at Kinloch Field (Lambert-St. Louis International Airport), St. Louis, Missouri. JC Penney opens store #1252 in Milford, Delaware, making it a nationwide company with stores in all 48 U.S. states. Space Race: M.I.T. scientists calculate Sputnik I’s booster rocket’s orbit. Who were born on October 11?